Khaki (UK /ˈkɑːkiː/, Canada and US /ˈkækiː/) is a color, a light shade of yellow-brown. Khaki is a loanword incorporated from Hindustani (Urdu or Hindi) ख़ाकी/خاکی (meaning "soil-colored") and is originally derived from the Persian: خاک [xɒːk] (Khâk, literally meaning "soil"), which came to English from British India via the British Indian Army. Khaki has been used by many armies around the world for uniforms, including camouflage. It has been used as a color name in English since 1848 when it was first introduced as a military uniform, and was called both drab and khaki—khaki being a translation of the English drab light-brown color. 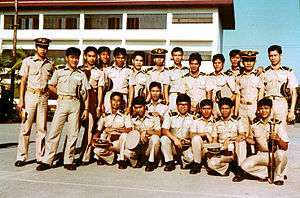 A khaki uniform is often referred to as khakis. Khaki was first worn in the Corps of Guides that was raised in December 1846 as the brain-child of Sir Henry Lawrence (1806–1857) Resident at Lahore, and Agent to the Governor-General for the North-West Frontier. Lawrence chose as its commandant Sir Harry Lumsden supported by William Stephen Raikes Hodson as Second-in-Command to begin the process of raising the Corps of Guides for frontier service from British Indian recruits at Peshawar, Punjab. Initially the border troops were dressed in their native costume, which consisted of a smock and white pajama trousers made of a coarse home-spun cotton, and a cotton turban, supplemented by a leather or padded cotton jacket for cold weather. For the first year (1847) no attempt was made at uniformity. Subsequently in 1848 Lumsden and Hodson decided to introduce a drab (khaki) uniform which Hodson commissioned his brother in England to send them – as recorded in Hodson's book of published letters, Twelve Years of a Soldier's Life in India. It was only at a later date, when supplies of drab (khaki) material was unavailable, did they improvise by dying material locally with a dye prepared from the native mazari palm. Some believe the gray drab/khaki color it produced was used historically by Afghan tribals for camouflaging themselves. The mazari could not, however, dye leather jackets and an alternative was sought: Cloth was dyed in mulberry juice which gave a yellowish drab shade. :537–539 Subsequently all regiments, whether British or Indian, serving in the region had adopted khaki uniforms for active service and summer dress. The original khaki fabric was a closely twilled cloth of linen or cotton. The impracticality of the traditional scarlet coat, especially for skirmishing, was recognised early in the 19th. century. Khaki-colored uniforms were used officially by British troops for the first time during the Abyssinian campaign of 1867–68, when Indian troops traveled to Ethiopia (Abyssinia) under the command of general Sir Robert Napier to release some British captives and to "persuade the Abyssinian King Theodore, forcibly if necessary, to mend his ways". 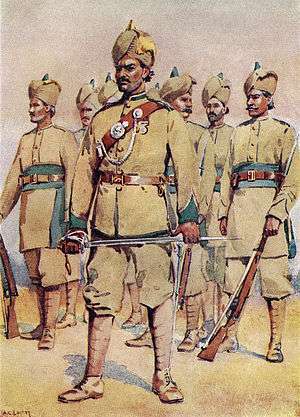 Subsequently, the British Army adopted khaki for colonial campaign dress and it was used in the Mahdist War (1884–89) and Second Boer War (1899–1902). The United States Army adopted khaki during the Spanish–American War (1898). The United States Navy and United States Marine Corps followed suit. The trousers known as "khakis", which became popular following World War II, were initially military-issue khaki-colored chino cloth twill, used in uniforms and invariably khaki in color. Today, the term is sometimes used refer to the style of trousers based on these trousers, properly called chinos, regardless of their color. ↑ Jackson, Major Donovan (1940). India's Army. London: S. Low, Marston & Co. OCLC 2939077. ↑ Williams, Cynric R. (1827). Hamel, the Obeah man (1st ed.). London: Hunt and Clarke. p. 279. Retrieved 3 February 2016. "...A red-coat on one of these rocks will only be a mark for these rebels." ↑ Tynan, Jane (2013). British Army Uniform and the First World War: Men in Khaki. London: Palgrave MacMillan. Wikimedia Commons has media related to khaki.